Fall is here, and you know what that means! It means it is time for football season to begin. Here at The Still, we love football season and we can’t wait to start cheering on our favorite teams now that the NFL is in full swing. The first week of football was so exciting for football fans of all types. Whether you saw the Ravens big win over the Bills, saw Aaron Rodgers’ heroic comeback during the Bears Game, or saw some sleepers score some major points for your fantasy football team—the first week of action was exciting to say the least. So, in honor of football season officially getting underway, we have decided to announce some very special and very exciting football game day specials right here at one of the best sports bars in Vegas. Here are the specials you can expect during every football game this season. The first deal is a $25 bucket of beer, where you can enjoy 5 beers at a discounted price. It is a great way to save when you and your friends are planning on enjoying a few domestic beers while watching the game. Everything the small and medium platter has with large bucket of wings. This is one of the best ways to feed your large group and is the perfect option if you are hosting a viewing party with your friends and fellow fans. After all, as the biggest sports bar in Las Vegas, there of course is plenty of room for all of your friends during your viewing parties. 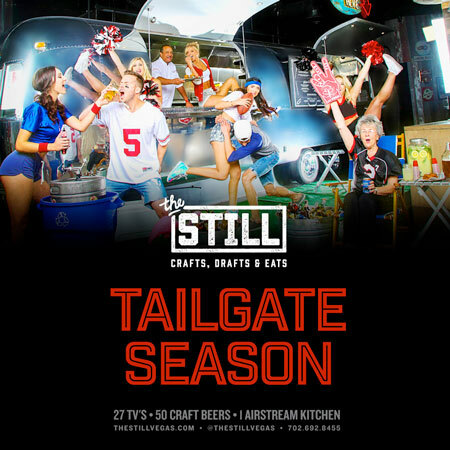 The Still is already known for being one of the biggest and best sports bars in all of Las Vegas, which means there is absolutely no better place to enjoy any football game, no matter who it is you are cheering for. Trust us, this is one of the best atmospheres in the city to be around other sports fans and to cheer on your favorite team. So, take advantage of this great environment and these great specials this football season by coming down to The Still!